He’s no stranger to kindness! 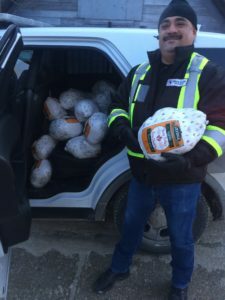 James Favel donated 28 turkeys today, on behalf of Winnipeg’s Bear Clan Patrol! We are inspired so much by all the greatness the Bear Clan has done for not only the North End, but the Winnipeg community. THANK YOU, BEAR CLAN! Perfect Christmas dinners?! CHECK! So excited to give these away with our team and the Bear Clan.. which is coming up very soon! If you see us, say hi! We might just have a gift for you!